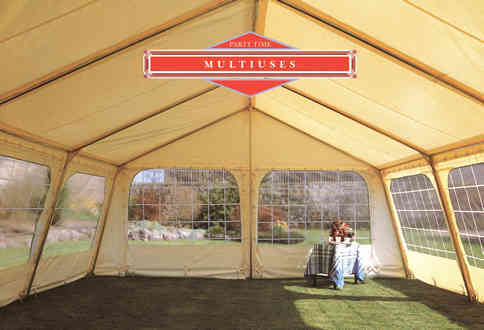 Ideal for garden parties, weddings, barbecues, or charity functions. 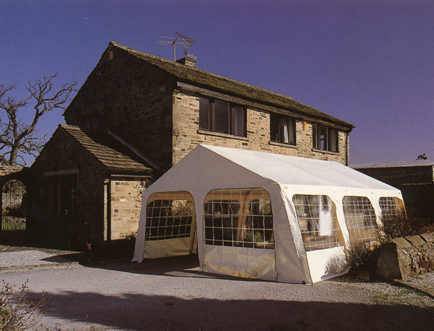 It is equally suitable at an office party or for a company promotion, the village fete or the school cake stall, extra space when linked to the house via patio doors, in fact anywhere that economical quick to erect cover is required. No tools required and suited to hard or soft ground, units can be joined together as required. 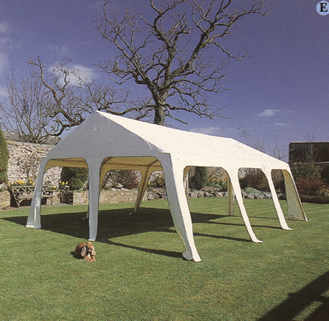 a) Lay out the roof sections of poles approximately where you require the finished marquee to stand. Slot all the roof sections together, then lay out all the legs ready to be slotted into the roof sections. b) Roll out the roof over the frame. c) Make sure the corners of the cover match the corners of the frame and cover and slot in the legs. Once one side is completed move to the other side and repeat. 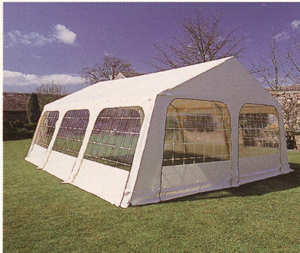 d) When the frame and cover are lifted to the full height the marquee can the be repositioned to its final location. Then simply hook the canvas to the feet. Identification is required at time of collection and all hires are subject to a £250.00 security deposit which is fully refundable upon safe return of the equipment.